There will always be moments when the colours turn to grey - instances when the wind pummels your gut and the cold cracks the skin only to water it with drops of acid rain; and that’s how it should be, for these times are there to justify the rest of them. Music is a reflection of existence, no matter how wretched or dejected. The melodies accompany us through the toughest of conditions, sharing in the melancholy and even encouraging to change the image in the mirror. 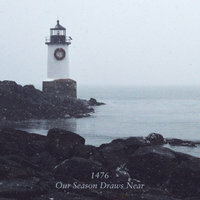 It takes a special talent to turn depression into something uplifting and on their latest effort “Our Season Draws Near” New England’s 1476 gnaw on the raw matters of solitude and detachment in the atmospheric mist of their eclectic Metal/Punk/Neofolk sound. “Our Season Draws Near” opens up with a sombre acoustic number that echoes of Nick Drake and basks in the ambiance of John Frusciante’s “Curtains”. We remain at one with every clink of the guitar and smooth Robert Smith-esque crooning before the instrumentation kicks and takes us the listener from the comforts of a bedroom to a scenic soundscape of reverberating melodies. The emotions are then unleashed as the tempos speed up to Punk territories and gallop past Post-Black fields with “Ettins” and “Winter Of Winds” where the band channel the essence of JOY DIVISION and amplify it with genuine Punk Rock resilience, taking despair and desolation in stride. Yet it’s not all ballads and punkish standards, on “Odessa” the band combine their love for acoustic accompaniment with big Sludgy chords to create a paradoxically bright Doom-inspired number, whilst “Solitude (Interior)” – the counterpart of its mellow brother “Solitude (Exterior)” – further explores their Post-Black inclinations by introducing some growls atop a rocking, melodic instrumental that is the embodiment of the inner pains of isolation. There record rounds out with “Winter of Wolves” – which is what I assume HANOI ROCKS would sound like if all the Glam were drained from them and they turned Goth – and “Our Ice Age”, a mature, 9-minute intimate ballad that may very well be the child of THE CULT and Warren Zevon. In terms of production it appears that the band were aiming for a rather barren, unprocessed sound, and although that feat has indeed been achieved – “Our Season Draws Near” sounds very raw and organic - the production values are surprisingly high and the songs, although pure and stripped, remain huge and atmospheric, bringing the modest instrumentation to soaring heights. Overall – “Our Season Draws Near” defines the art of introspection. 1476 make use of a multitude of formidable influences to create a tonally consistent meditation on the degrees of solitude whilst looking out across a sea of possibilities.